If these documents are as authentic as they certainly seem to be, Obama is NOT qualified to be our President and he sits in the White House illegally! This is what Obama has spent almost $2M (so far) to hide. Why is this so difficult for him unless ??? could this be why? Here’s a close-up of the top of the document where you can plainly read his name and his parents names, etc…. A British history buff was asked if he could find out who the colonial registrar was for Mombasa in 1961. After only a few minutes of research, he called back and said ‘Sir Edward F. Lavender. Note the same name near the bottom of the photo above. Source(s): Kenya Dominion Record 4667 Australian library. 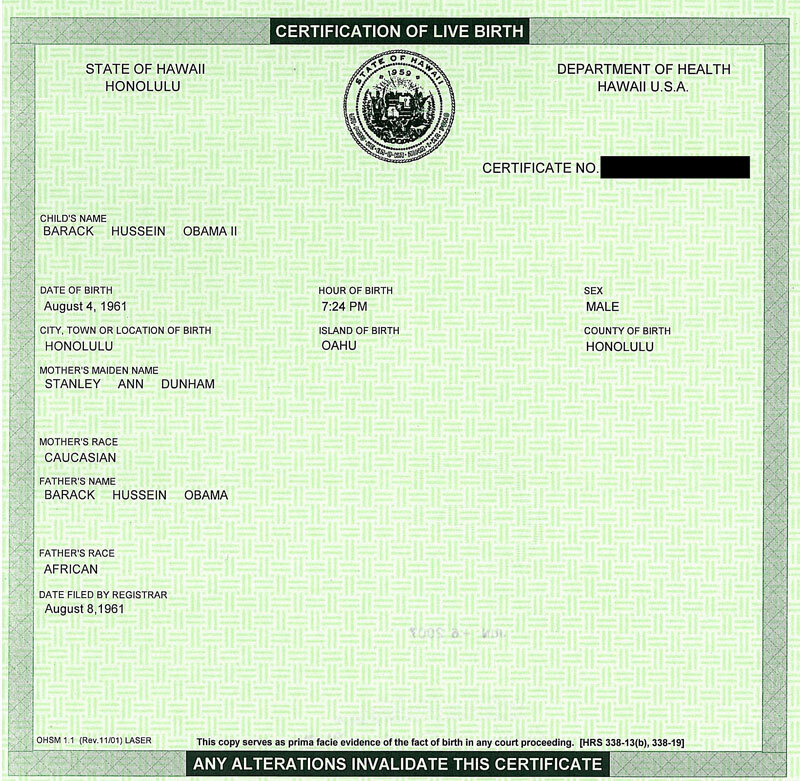 The above document is a ‘Certified Copy of Registration of Birth’ but below is a copy of the actual Certificate of Birth, the real-deal legal kind of certificate. 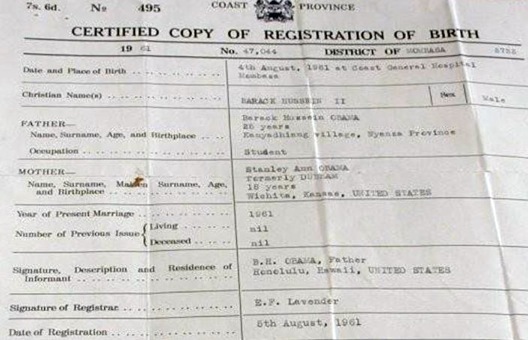 The local Muslim Imam in Mombasa named ‘Barack’ with his Muslim middle name ‘Hussein’ so his official name on this certificate is: Barack Hussein Obama II. The grandmother of Barack Hussein Obama, Jr. reveals the story of his birth in Mombasa, Kenya, a seaport, after his mother suffered labor pains while swimming at ocean beach in Mombasa . On August 4, 1961 Obama’s mother, father, and grandmother were attending a Muslim festival in Mombasa, Kenya. His mother had been refused entry to airplanes due to her nine-month pregnancy. It was a hot August day at the festival so the Obama’s went to the beach to cool off. While swimming in the ocean his mother experienced labor pains so was rushed to the Coast Provincial General Hospital, Mombasa, Kenya where Obama was born a few hours later at 7:21 pm on August 4, 1961 (what a sad day for the USA!). 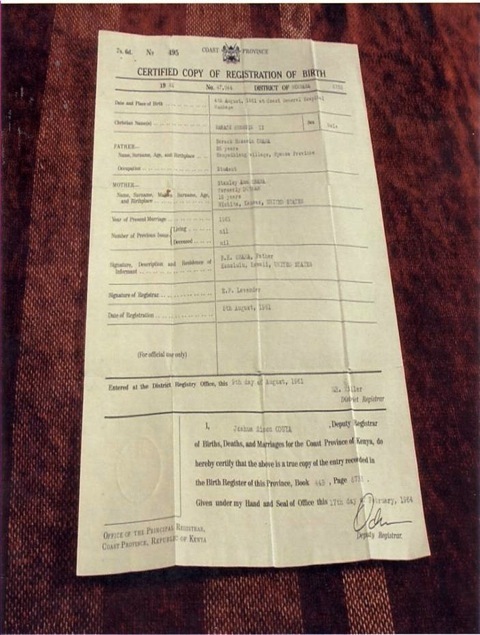 Four days later his mother flew to Hawaii and registered his birth in Honolulu as ‘a certificate of live birth’; which omitted the place and hospital of birth. Letter from Kitau in Mombasa, Kenya: I happen to be Kenyan. I was born 1 month before Obama at Mombasa medical center. I am a teacher here at the MM Shaw Primary School in Kenya . I compared my birth certificate to the one that has been put out by Taitz and mine is exactly the same. I even have the same registrar and format. The type is identical. I am by nature a skeptical person. I teach science here and challenge most things that cannot be proven. So I went to an official registrar today and pulled up the picture on the web. They magnified it and determined it to be authentic. There is even a plaque with Registrar Lavender’s name on it as he was a Brit and was in charge of the Registrar office from 1959 until January of 1964. The reason the date on the certificate says republic of Kenya is that we were a republic when the “copy” of the original was ordered. I stress the word “copy”. My copy also has republic of Kenya. So what you say is true about Kenya not being a republic at the time of Obama’s birth; however, it was a republic when the copy was ordered. The birth certificate is genuine. It will be authenticated by a forensic auditor. We are very proud Obama was born here. We have a shrine for him and there are many people who remember his birth here as he had a white mother. They are being interviewed now by one of your media outlets. Fortunately, they even have pictures of his parents with him immediately after his birth at the Mombasa hospital with the hospital in the background. It will be a proud day for us when it is proven that he was born here and a Kenyan became the most powerful man in the world. I encourage anyone to come here and visit. I will be happy to take you and show you the pictures at the hospital myself as well as my document and many others that are identical to what Taitz posted. God Bless. Kitau. So, how much more proof do we need? Lolo Soetoro, Stanley Ann Dunham Soetoro, baby Maya Soetoro, and 9-year-old Barry Soetoro. 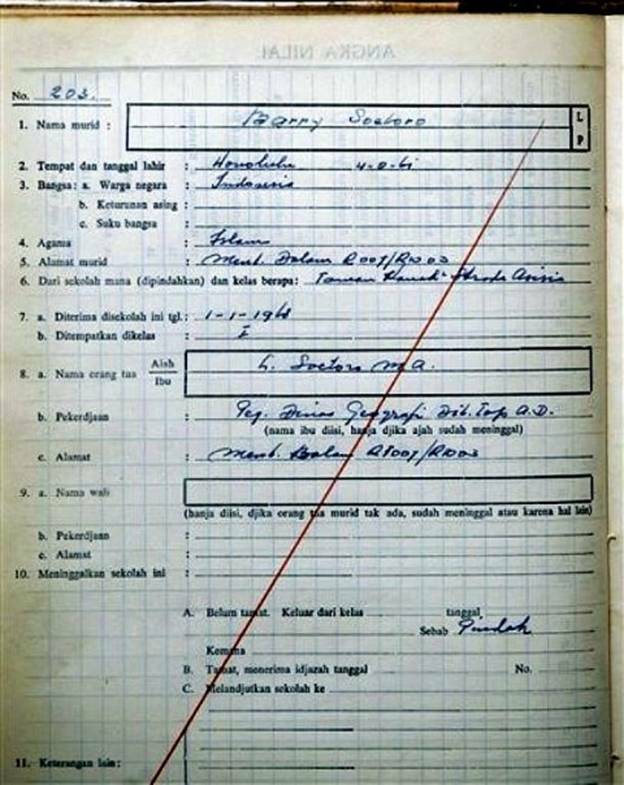 This registration document, made available on Jan. 24, 2007, by the Fransiskus Assisi school in Jakarta, Indonesia, shows the registration of Barack Obama under the name of: Barry Soetoro made by his step-father, Lolo Soetoro. How did this little INDONESIAN Muslim child – Barry Soetoro, (A.K.A. Barack Obama) get around the issue of nationality to become President of the United States of America? PART 2: In a move certain to fuel the debate over Obama’s qualifications for the presidency, the group “Americans for Freedom of Information” has released copies of President Obama’s college transcripts from Occidental College. The transcript indicates that Obama, under the name Barry Soetoro, received financial aid as a foreign student from Indonesia while an undergraduate at the school. The transcript was released by Occidental College in compliance with a court order in a suit brought by the group in the Superior Court of California. The transcript shows that Obama (Soetoro) applied for financial aid and was awarded a fellowship for foreign students from the Fulbright Foundation Scholarship program. To qualify for this scholarship, a student must not be an American citizen and must claim foreign citizenship. 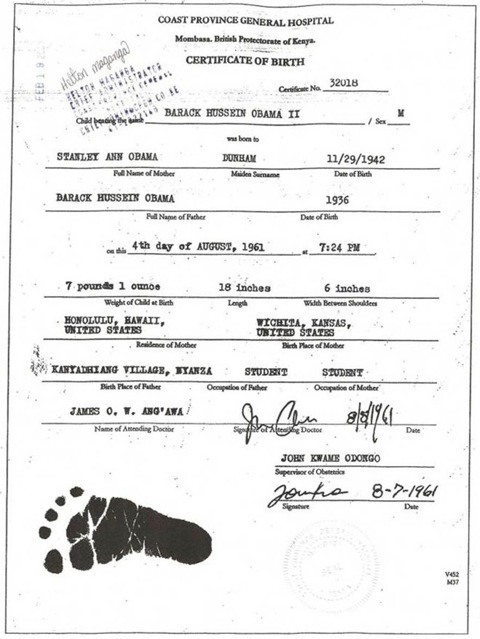 This document provides the smoking gun that many of Obama’s detractors have been seeking – that he is NOT a natural-born citizen of the United States – necessary to be President of these United States. 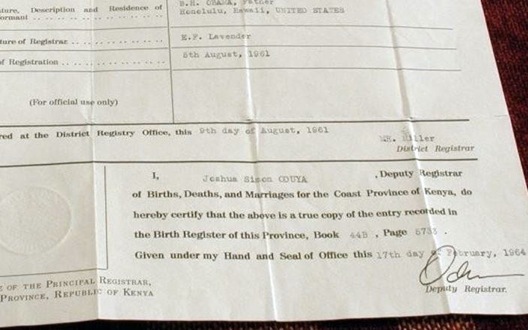 Along with the evidence that he was first born in Kenya, here we see that there is no record of him ever applying for US citizenship. Gary Kreep of the United States Justice Foundation has released the results of their investigation of Obama’s campaign spending. This study estimates that Obama has spent upwards of $950,000 in campaign funds in the past year with eleven law firms in 12 states for legal resources to block disclosure of any of his personal records. 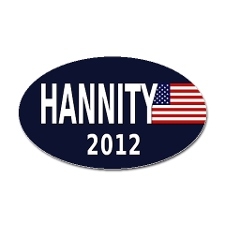 Why not Hannity??? People elected a man who can’t even provide his birth certificate. A Certificate of Live Birth IS NOT a Birth Certificate! The Certificate of Live Birth is the standard certified long form filled out in hospitals. This document is turned over to the State Register, where the information is kept on file. From the certificate of live birth or the original, a copy called the live birth certification is obtained. The Certification of Live Birth represents the short form of the original certified photo copy. This certification of live birth enables a person to obtain important documents such as social security number and benefits and passports. It gives people permission to attend school, and to obtain such things as life insurance, health insurance, tax credits and child benefits, especially if you are applying for assistance from a state government agency or running for PRESIDENT OF THE UNITED STATES OF AMERICA!!! While having a certificate of live birth is important, it is not proof alone of a person’s identity!!!!! !